Do you know how to use your fridge drawers to keep your fresh fruit and veg fresh for longer? If it wilts then it needs high humidity, which means the drawer will be completely closed off from the rest of the fridge and the humidity in the drawer will increase. 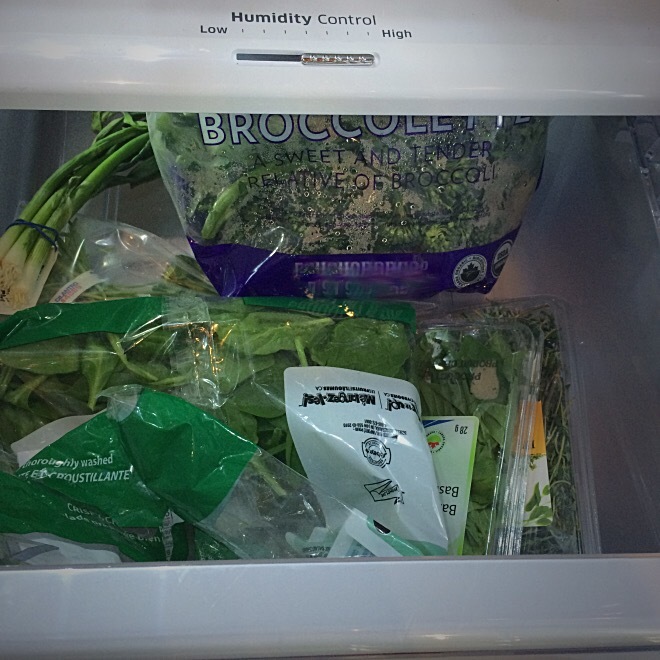 Foods like green onions, fresh spices, broccoli, lettuce, spinach and other leafy greens that can wilt should go in this HIGH humidity drawer. If a food rots then it needs a lower humidity when you slide the setting to a lower humidity the air from the rest of the fridge will be able to circulate through. This tip immediately made sense to me as we learned about foods that emit ethylene gasses in school. Things like tomatoes, avocados, and ripe bananas can go in the LOW humidity drawer, the gasses they emit can then escape. Tomatoes can get chill injury if your fridge is too cold. Keep them toward the front of the fridge if you feel they are going off too quickly or try keeping them out of the fridge. Keep them in a bowl on their own and the gasses they emit won’t ripen your other fruits too quickly. To speed up the ripening of an avocado keep it on the counter in a paper bag, the gasses it emits can help it ripen as they get trapped in the paper bag. Buy what you can eat so your foods don’t go bad before you can eat them. Try freezing food if you think it’ll go bad before you can eat it. If your vegetables are going to go bad try making a puree of the vegetables in a blender and freeze them in dated plastic zipper bags. You can then thaw and use in soups and sauces at your convenience. The rest of the information came from the far, far depths of my brain as things quickly came back to me after reading about ethylene. I give full credit to Dr. Kwan Wong at MSVU for teaching me about this process.